MAGI1 expression is required for d-flow–induced EC activation. (A and B) Expression of VCAM-1, MAGI1, and α-tubulin in NLC and Magi1–/– MECs treated with TNF-α (10 ng/ml) for 0–6 hours was determined by Western blotting. (B) VCAM-1 expression quantified by densitometry. Data represent mean ± SEM (n = 3). P < 0.0001 between NLC and Magi1–/– groups. (C) MAGI1 depletion inhibits NF-κB activation. MECs were subjected to an NF-κB activity assay in the presence (right) or absence (left) of p90RSK overexpression. Cells were then treated with TNF-α for 24 hours (10 ng/ml, left), and their NF-κB activity was measured. Data represent mean ± SEM (n = 6). **P < 0.01. (D) MAGI1 expression is reduced in HUVECs treated with siRNA-targeted Magi1 (siMAGI1). siCont, control siRNA. (E) MAGI1 depletion inhibits NF-κB activation. HUVECs were transfected with the indicated siRNAs and then treated with or without d-flow (left), TNF-α (10 ng/ml, middle), or Thb (10 U/ml, right) for 24 hours, and their relative NF-κB luciferase activity was measured. Data represent mean ± SEM (n = 6). **P < 0.01. 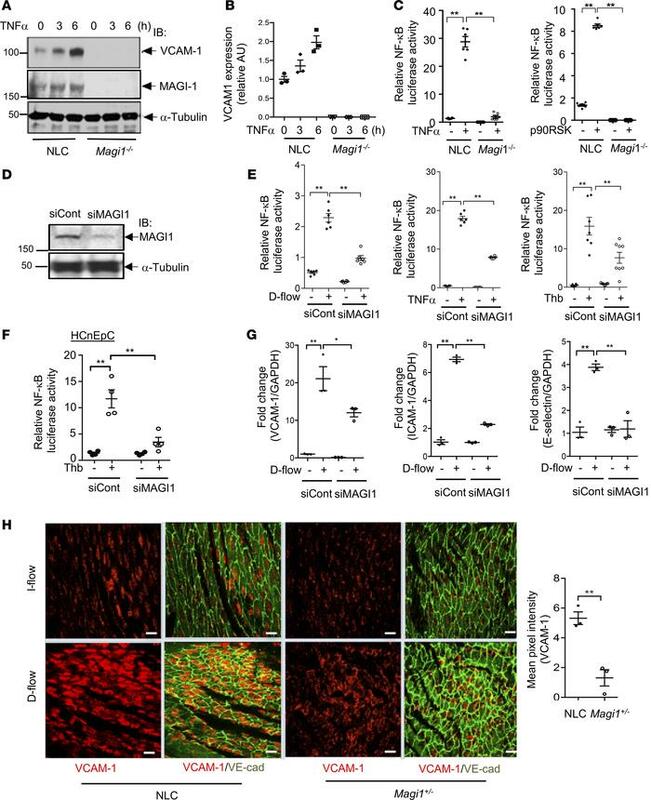 (F) MAGI1 depletion inhibits NF-κB activation in human colonic epithelial cells (HCnEpC). Cells were transfected with the indicated siRNAs and treated with or without Thb (10 U/ml for 24 hours), and their relative level of NF-κB luciferase activity was measured. Data represent mean ± SEM (n = 6). (G) MAGI1 depletion inhibits d-flow–induced expression of adhesion molecules. siRNA-treated ECs were exposed to d-flow, total RNA was obtained from the cells, and levels of VCAM-1, ICAM-1, and E selectin RNA expression were quantified using qRT-PCR. Data represent mean ± SEM (n = 3). *P < 0.05; **P < 0.01. (H) Reduced intensity of VCAM-1 staining in the d-flow region in the Magi1+/– mouse group. En face preparations of mouse aortas were coimmunostained with anti–VE-cadherin and –VCAM-1 antibodies. Fluorescent images of anti–VCAM-1 staining in aorta areas exposed to l-flow and d-flow were recorded using confocal laser scanning microscopy (left). Scale bars: 20 μm. Data represent mean ± SEM (n = 3). **P < 0.01. Statistical differences between 2 independent groups (H) were assessed using the 2-tailed Student’s t test and 1-way ANOVA followed by Bonferroni’s post hoc testing for multiple groups (B, C, E, F, and G).